Mini Puppy Cross Stitch Pattern to print online. 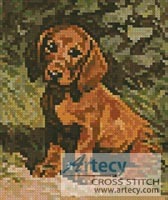 This mini counted cross stitch pattern displays a cute little brown Dachsund puppy in the garden. A larger version of this Pattern can also be found in the Dogs Category here. This product was added to our catalog on Sunday 25 July, 2010.